, the fourth and youngest son of bishop Bayly, was educated at Cambridge, and having commenced B. A. was presented to the subdeanery of Wells by Charles I. in 1638. In 1644, he retired with other loyalists to Oxford, where, proceeding in his degrees he was created D. D. and two years after wle find him with the marquis of Worcester, in Ragland castle, after the battle of Naseby. When this was surrendered to the parliament army, on which occasion he was employed to draw up the articles, he travelled into France and other countries; but returned the year after the king’s death, and published at London, in 8vo, a book, entitled “Certamen Religiosum, or a conference between king Charles I. and Henry late marquis of Worcester, concerning religion, in Ragland castle, anno 1646.” But this conference was believed to have no real foundation, and considered as nothing else than a prelude to the declaring of himself a papist. The same year, 1649, he published “The Royal Charter granted unto kings by God himself, &c. to which is added, a treatise, wherein is proved, that episcopacy is jure dvvino” 8vo. These writings giving offence, occasioned him to be committed to Newgate whence escaping, he re^ tired to Holland, and became a zealous Roman catholic. During his confinement in Newgate, he wrote a piece entitled, “Herba Parietis, or the wall-flower, as it grows out of the stone-chamber belonging to the metropolitan prison; being an history, which is partly true, partly romantic, morally divine; whereby a marriage between reality and fancy is solemnized by divinity,” Lond. 1650, in a thin folio. 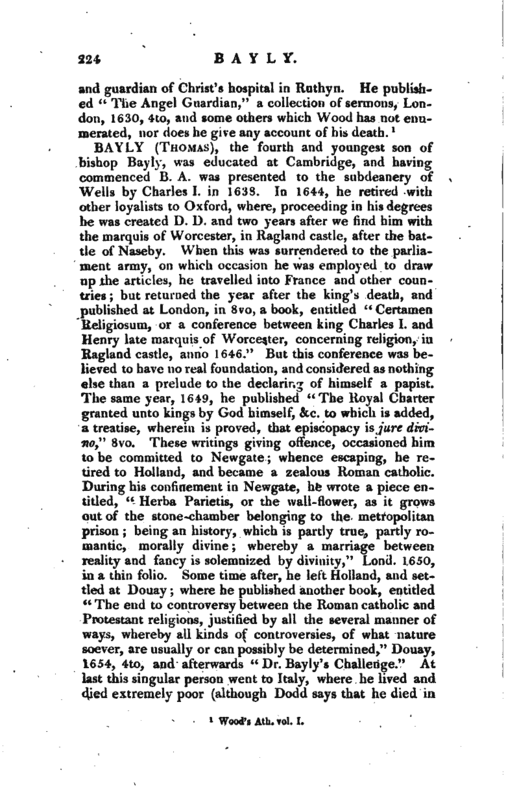 Some time after, he left Holland, and settled at Douay where he published another book, entitled “The end to controversy between the Roman catholic and Protestant religions, justified by all the several manner of ways, whereby all kinds of controversies, of what nature soever, are usually or can possibly be determined,” Douay, 1654, 4to, and afterwards “Dr. 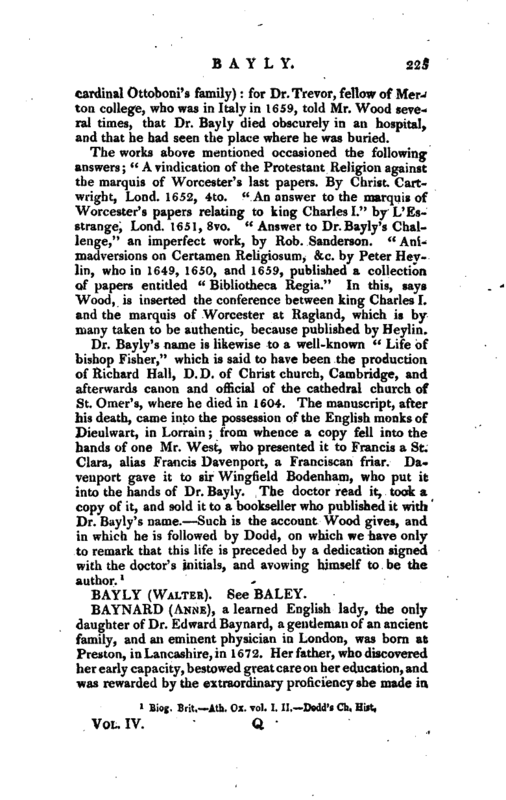 Bayly’s Challenge.” At last this singular person went to Italy, where he lived and died extremely poor (although Dodd says that he died in cardinal Ottoboni’s family) for Dr. Trevor, fellow of | Merton college, who was in Italy in 1659, told Mr. Wood several times, that Dr. Bayly died obscurely in an hospital, and that he had seen the place where he was buried. The works above mentioned occasioned the following answers; “A vindication of the Protestant Religion against the marquis of Worcester’s last papers. By Christ Cartwright, JLond. 1652, 4to.” An answer to the marquis of Worcester’s papers relating to king Charles I.“by L’Esstrange, Load. 1651, 8vo.” Answer to Dr. Bayly’s Challenge,“an imperfect work, by Rob. Sanderson.” Animadversions on Certamen Religiosum, &c. by Peter Hey1m, who in 1649, 1650, and 1659, published a collection of papers entitled “Bibliotheca Regia.” In this, says Wood, is inserted the conference between king Charles I. and the marquis of Worcester at Ragland, which is by many taken to be authentic, because published by Heylin. Biog. Brit.—Ath. Ox. Vol. I. II.—Dodd’s Ch. Hist.